The goal for every startup – fintech or otherwise – is securing funding for growth. Yet most fintech startups launch with an abundance of ideas and optimism, but without the capital to test and scale their products. So their journey ends before they can achieve impact – and before the broader ecosystem can benefit from their innovations. The problem is, securing funding in emerging markets is especially difficult: Capital is scarce, many startup models are unproven in these environments, traction with low-income customers can take longer, and foreign investors are unfamiliar with the sector and local markets. This results in a “valley of death” for early-stage companies, as they fail to generate sufficient revenue to offset the costs of launching in a realistic timeframe. As a result, entrepreneurs invest their time and energy in running around to raise capital to bridge this valley, rather than building and testing their products to successfully reach growth milestones. Without these milestones, startups cannot demonstrate the proof points that investors seek. So investors report they are seeing companies that are just too early or too risky for them to consider, and founders are unable to find patient capital for testing and iterating their products. Yet even under these circumstances, Catalyst Fund companies are closing deals. For every dollar invested in Catalyst Fund, a global accelerator program managed by BFA, our early-stage, inclusive fintech startups have gone on to raise $13.05 in investment capital. 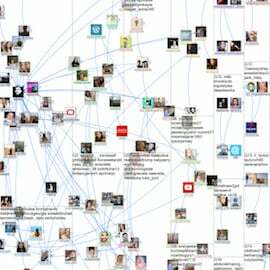 Help investors evaluate fintech startups: In unfamiliar markets, investors may not know what to expect. 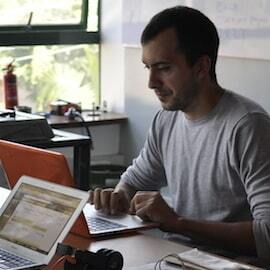 Very promising results in East Africa, for example, may seem trivial relative to the margins and scale common in developed markets, particularly when compared to tech innovation hubs like Silicon Valley. In these circumstances, investors may be unduly convinced by charisma, savvy presentations or cutting-edge technology, even when products lack a viable value proposition for the target consumer. Catalyst Fund shares insights gained through the acceleration process with investors and presents them with cohorts of inclusive fintech startups to compare and contrast. This highlights the strengths and weaknesses of each business model, giving investors a richer context in which to evaluate them. Catalyst Fund also gives investors a framework to assess the social impact potential of inclusive fintech startups. 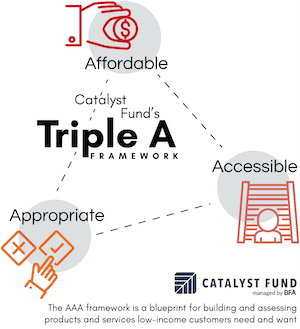 Built on the direct learning from our 20 startups, our AAA Framework (pronounced Triple A) provides a method for determining if financial products and services are designed to benefit low-income customers. Offerings whose features are prioritized to be accessible, affordable and appropriate address the challenges of customers who live in low-trust, low-tech, low-resource and last-mile environments. Provide startups with the resources to generate evidence that speaks to investors: Startups are not always familiar with the proof points investors are looking for; different investors might ask for very different examples of traction in which expectations can be misaligned with reality. For example, expecting an early consumer-facing business to generate high sales numbers may be both daunting and potentially unreasonable when demonstration of demand by a sizeable target market via customer research may be sufficient. Moreover, first-time entrepreneurs do not always know how to build these proof points quickly. They are faced with limited access to early-adopters and consumers who view new entrants with mistrust. Catalyst Fund fleshes out startup teams by bringing onboard experienced entrepreneurs, product managers and former investors who know low-income customers and emerging markets. Catalyst Fund advisors (BFA’s experts that bring over 12 years of experience in financial inclusion) can guide startups to most effectively allocate resources towards achieving early proof points. At this stage of a startup’s life, getting to product market fit – ie: developing a solution that is wanted by a large enough target market – is critical. Catalyst Fund offers customized technical and venture building support, flexible capital, and the know-how to build accessible, affordable and appropriate solutions that the market will bear. Curate introductions between investors and startups: Entrepreneurs need like-minded investors, not just open wallets. Investors need to conduct significant due diligence, which takes time. The right match, in which the investor understands the business, the sector and the market constraints, makes for better mutual alignment on expectations and company trajectory. To encourage this, Catalyst Fund curates double-blind introductions between its entrepreneurs and investors, the latter of whom are members of its Circle of Investors, a group of over 40 premiere impact and commercial investors. If both parties perceive a fit — the venture fits an investor’s criteria and the investment fulfills the startup’s strategic need — then Catalyst Fund makes the introduction. To date, Catalyst Fund has identified six pairings which converted to a follow-on investment. Over time, Catalyst Fund has created an ecosystem of almost 50 select investors around the world. Post-acceleration, our investment in the startups has resulted in a 10x return on average for capital raised by our startups, with total amounts raised ranging between 2x and 36x the startups’ pre-acceleration funding. We continue to work with entrepreneurs to reach the proof points investors require, helping them to secure follow-on capital and generate the body of evidence that can unlock more capital and attract more talent to inclusive fintech. Through these efforts, we are exposing a broader group of investors to early-stage innovators and building vital global and local connections between them. Yet we are still just scratching the surface of what is needed to scale innovative early-stage inclusive fintech ventures. More capital, talent and resources need to be activated in the ecosystem to accelerate the arrival of AAA products and services to underserved populations. 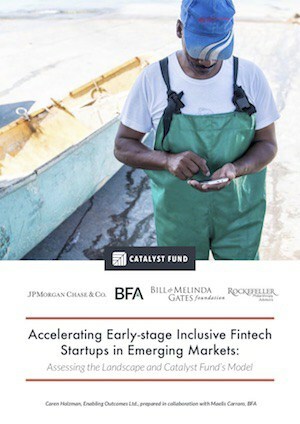 In a new report by Catalyst Fund, “Accelerating Early-stage Inclusive Fintech Startups in Emerging Markets: Assessing the Landscape and Catalyst Fund’s Model,” we took stock of the accelerator landscape to evaluate our program. 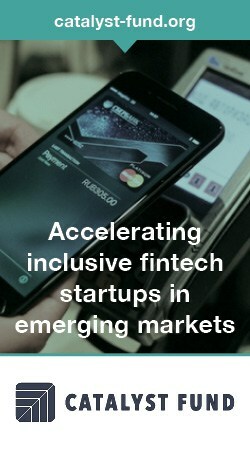 In doing so, we identified 11 accelerators that touch or specialize in inclusive fintech in emerging markets. 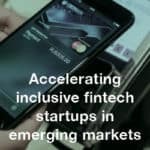 This number is relatively small compared to the global fintech sector, and in relation to inclusive fintech’s potential to impact large numbers of individuals across markets. Nevertheless, the report demonstrates that our particular method of acceleration is valuable to startups and proven in its AAA approach, and that it delivers value for money to program funders. More broadly, we view the report as part of our efforts to consolidate and share our lessons as public resources (including blogs, publications, webinars and toolkits) for fintech startups and accelerators, investors, donors, and traditional financial services providers. We feel this is essential for deepening the knowledge base for the innovation ecosystem, helping to unlock capital and drive more players to inclusive fintech. Looking forward, we’ll continue to leverage our global perspective of what is happening in inclusive fintech, combined with bottom-up, local learning to bring to light the successes, the needs and the opportunities that are shaping the sector. Maelis Carraro is a senior associate and Malika Anand is a consulting associate at BFA, a NextBillion partner.